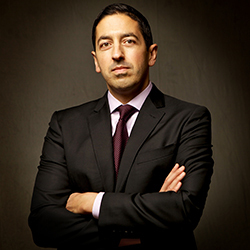 Sandro Galea M.D., M.P.H., Dr.P.H. Dr. Galea is Boston University's Robert A. Knox Professor and the current dean of the School of Public Health. In the past, he was the Anna Cheskis Gelman and Murray Charles Gelman Professor and chair of the Department of Epidemiology at the Columbia University Mailman School of Public Health. Dr. Galea is a physician and an epidemiologist, who is interested in the social production of health of urban populations. His work explores innovative cells-to-society approaches to population health questions. His primary focus is on the causes of brain disorders, particularly common mood-anxiety disorders and substance abuse. He has long had a particular interest in the consequences of mass trauma and conflict worldwide, including as a result of the September 11 attacks, Hurricane Katrina, conflicts in sub-Saharan Africa, and the American wars in Iraq and Afghanistan. The National Institutes of Health, Centers for Disease Control and Prevention, and several foundations have funded his research. He has published over 400 scientific journal articles, 50 chapters and commentaries, and 7 books and his research has been featured in The New York Times, NPR, the Wall Street Journal, and many other media outlets. During Dr. Galea's tenure at Columbia, the Department of Epidemiology launched several new educational initiatives and substantially increased its focus on six core areas: chronic, infectious, injury, lifecourse, psychiatric/neurological, and social epidemiology. Dr. Galea chaired the New York City Department of Health and Mental Hygiene's Community Services Board and sits on its Health Board. He was named one of TIME magazine's epidemiology innovators in 2006. He is past-president of the Society for Epidemiologic Research and an elected member of the American Epidemiologic Society and of the Institute of Medicine of the National Academies of Science. Karpati, A., Galea, S., Awerbuch, T., Levins, R. Variability and Vulnerability at the Ecological Level: Implications for Understanding the Social Determinants of Health. AJPH, 2002, 92(11): 1768-72. Galea, S. (ed.). Macrosocial Determinants of Health. New York: Springer, 2007.